In the interconnected web that we all are a part of, it is impossible to discount the mystery of honeybee and human relationship throughout the centuries. 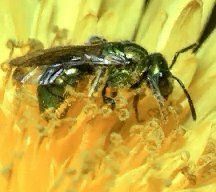 We have been inextricably bound to a common fate, dependent upon the honeybee’s free pollination services. Our whole food system relies on this gift. And then there are our human stories, religious ritual and myths intertwined with the lowly honeybee. A honey stained vessel was found buried in a tomb over 5, 500 years ago in the Caucasus of Russia—some 2,000 years older than the honey found in King Tut’s tomb in Eygpt. Packed for the afterlife, honey represented the bee as a symbol of resurrection. Christianity adopted this ancient symbol and even today, at Easter tide, the honey bee is celebrated in the Great Vigil, on the eve of Easter, calling forth the risen Christ by the lighting of the candle made of beeswax. 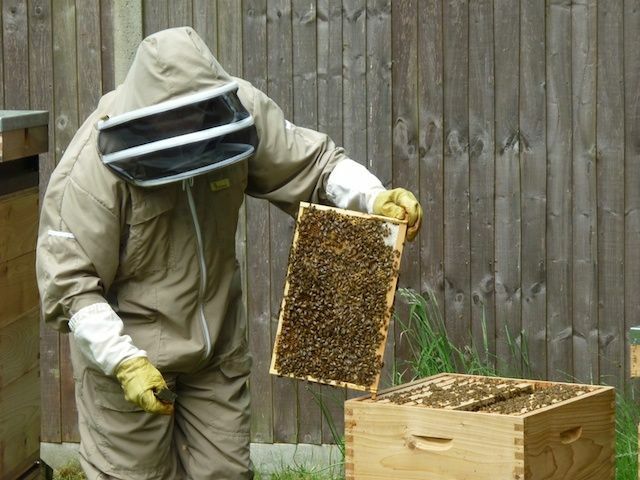 On October 19, 1996, a quiet, dedicated and much loved beekeeper passed away in the seclusion of his East Devon home. Each day, for the three days prior to his passing, a lone bee flew quietly around the room, leaving the room and returning to the hive as daylight faded, only to return at first light the following day. The beekeeper, William Mawson, Bill to all who knew and loved him, died peacefully during the evening. 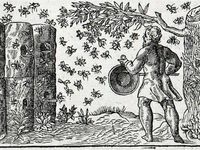 Early the next morning, Bill’s grieving widow, Annette, walked slowly and thoughtfully to the nearby apiary to tell the bees of his passing, thus keeping faith with the ancient tradition. She spoke softly and slowly as she said, “Poor master has passed away, but he is still with us in spirit”. Four days later, in the tranquility of the old Offwell Parish Church, his widow and family were joined by close friends and beekeepers to celebrate Bill’s life, give thanks for his friendship, kindness and achievements, and pay their last respects to a gentle man. As the funeral cortege entered the nave of the church, it was followed silently and almost unnoticed by a host of bees, which settled quietly toward the rear of the building in the south side. As the rector began his eulogy, the congregation became aware of the sound of bees on the wing. The rector stopped speaking as the bees hovered above the gathering. And then, as spontaneously as it had arisen, the sound of flying bees declined before dying away into the distance. Did the bees come to say a final farewell to their faithful departed friend, Bill? We can only ponder the mystery of the story. There is still so much I do not know about my bee friends. But I do know one thing. Bees and humans. We are kin. ← Some Days are like that…. I love this post. It brings to mind the memory of the beekeeper outside of the old Lincolnshire church in East England. This church was closest to where my relatives lived before immigrating with the first Puritans. Kind, wise, quirky and hospitable the beekeeper welcomed us. Seemed like a perfectly good omen and as if we were in a movie.